A while back, I sat down with Kevin William David of Siftery for an interview about why we’re building TalkJS. 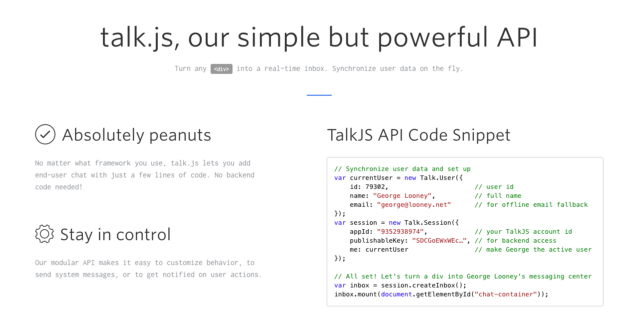 TalkJS is integrated messaging for every web and mobile product. Add user-to-user chat to your web app or add buyer-seller messaging to your online marketplace or social platform. You’ll have it up and running in 10 minutes. Kevin William David interviewed Joshua Schoenaker, Founder of TalkJS to learn more. Can you tell us about what you are working on? What is TalkJS? 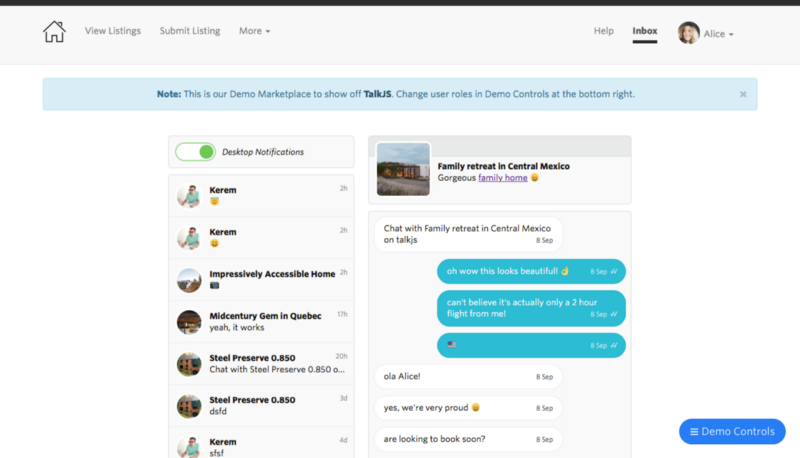 TalkJS is user-to-user chat functionality for your web app, marketplace or social platform. Turn any <div>into a 2-way chat box. No need to reinvent the wheel. You’ll have it up and running in 10 minutes. 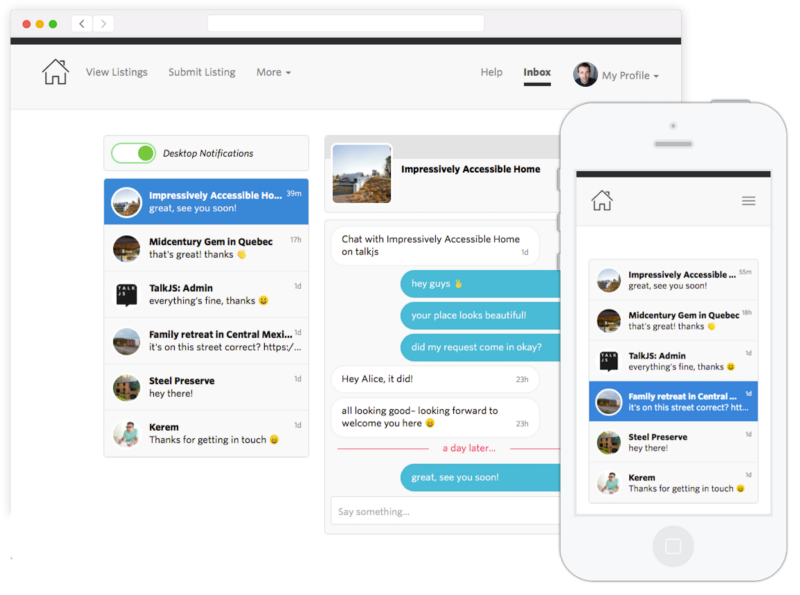 It’s similar to the chat features Airbnb provides for communication between hosts and customers. We were originally working on a messaging product for a different market, when a couple of marketplace-type companies asked us the same question: can we use your messaging solution for buyer-seller chat? So, then we asked around, and 7 out of 10 marketplaces we asked, were experiencing the same problem for which they hadn’t found a proper solution yet. Online platforms, marketplaces and other apps are rushing to add realtime user-to-user messaging to their sites. Users expect communication to be fast and direct, platform owners need it to happen on their platform and not elsewhere. This is cost intensive to get right, and so far only the largest platforms succeed (e.g. AirBnB, Booking.com, Upwork all released realtime messaging in the last 12 months). Who are your top competitors & how is TalkJS different from what’s already exists in the market? What’s unique about what you are building & why do you think companies should use TalkJS? Other messaging infrastructure products (e.g. Sendbird, Layer, Twilio Programmable Chat) only supply backend infrastructure with some UI building blocks. 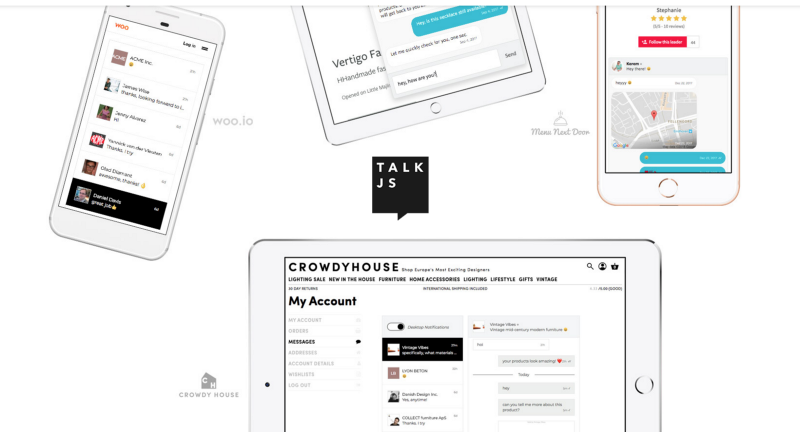 TalkJS is the only mature option in this space that provides a fully-featured, polished, embeddable user interface with a simple but powerful API and integrated email/sms/push fallback. Who uses TalkJS? Can you tell us a bit about the different customer segments using TalkJS? What types of roles do your customers have at their companies ? TalkJS works great for any web app where 2+ users touch: online marketplaces, social platforms, online communities, collaboration tools, (serious) games, and so on. Current customers include companies like designer homeware site Crowdyhouse and a Dutch site for connecting people with particular skill sets Skillseeker. First and foremost, TalkJS is focused on the users of our customers’ products. Other than that it’s mostly the product managers, CEOs and developers who interact with TalkJS. We’re proud of how easy TalkJS is to integrate and our dashboard gives the CEOs and product managers deep insights into how their users behave on their platform. How are your customers using TalkJS? Could you share a few different use cases? TalkJS is being used both before a sale on marketplace sites, to ask pre-sales questions, and after, to deliver customer support. In general we hear from our customers that direct contact between their sellers and buyers increases trust, convenience, and retention. Have there been unique use cases for TalkJS that you hadn’t thought of or expected? We recently signed up a customer who is using TalkJS for connecting people with psychic Tarot card readers to predict their futures. Because we’re essentially a developer tool, the most important thing for us is that developers and entrepreneurs both enjoy working with our product and see enough value to justify a purchase. That creates word-of-mouth which still is the most valuable marketing tool for a product like ours. Next to that, being featured on places where these folks hang out like Product Hunt and Hackernews drives significant traffic. The other thing we’re starting to invest more and more in, is content marketing. In our case this means blogging about how to best apply our product, what kind of use cases you can cover with TalkJS, and how to technically implement the product in different platforms, programming languages and so forth. This will pay off in the long tail, but we’re already seeing the beginning of this now. One big challenge was to make sure the product works reliably on virtually all devices, screen resolutions, browsers, and internet connections. Luckily, we’ve been building our messaging platform for a year prior to discovering this market, so the technology had been proven to send millions of messages in all kind of situations and all the bugs and quirks have been ironed out already. Currently we only ‘integrate’ with email, for sending notifications when either side is not logged on to our customer’s platform at that time. It’s a full integration in that replies to these emails end up back inside the chat. We’re getting some requests for integrating with Zendesk as well as other existing messaging apps, and we’re currently exploring whether that will make sense for more of our customers. What are the top products that you depend to run the company & how do you use them? We rely heavily on Slack for internal communication, especially since we’re half-remote. We use Screenhero which you cannot download anymore since they got acquired by Slack, but is still better than Slack’s baked in calling feature. We love TrackJS and Papertrail for error monitoring. We use a customized Redash dashboard for real-time reporting. Dropbox Paper for all text-related stuff, which beats Google Docs for us because it forces us to focus on the content.